Though they may resemble a huge version of a Scottish terrier, giant schnauzers are the largest variety of the schnauzer breed. Its hardy coat, which can be either black or salt and pepper, resisted weather while driving cattle toward markets in the Bavarian Alps of the early 1900s. Great Danes, and arguably Bouviers as well, contributed to the giant's lineage. Grooming this noble breed requires a patient and experienced hand; complex techniques may be needed. Brush out your schnauzer's coat thoroughly. Use a fine-toothed comb to ensure that every inch of fur has been completely cleared of matting, which can impede the grooming process. Proceed with clipping only if you have chosen not to present your giant schnauzer in dog shows. Show-dog schnauzers require a form of advanced grooming known as stripping in order to achieve the correct coat texture and shape. Trims are best for schnauzers who are primarily pets. 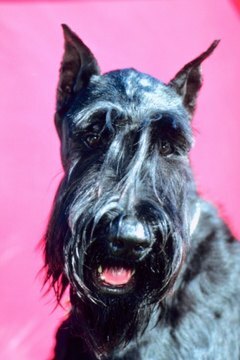 Avoid bathing giant schnauzers; a properly textured and maintained coat should resist most dirt and damage. If you must lather up your schnauzer, restrict the bath to the leg furnishings. Add a few drops of vinegar to foster a healthy shine. Use a #7 blade or #2 or #3 guard to trim your schnauzer's body fur. Cut only the area between the dog's shoulders and elbows, along the body to the sides of his hindquarters. Handle your clippers at an angle that moves from the shoulders and points toward the hind legs. Trim the back legs of the rear using the #2 or #3 guard. Use a #1 or #2 guard to clip the hair along the inner thighs, emphasizing the natural hairline. Comb your schnauzer's chest hair downward before trimming it. Trim an upside-down "V" shape formed by the neck and front of the forelegs. Brush away excess hair and clip the chest hair with thinning shears. For the dog's hocks on the rear legs, comb the hair away from the bone, and scissor them so that the hock hairline is straight. Find your dog's nodular whiskers along his muzzle and brush the beard hair away from the face. Find a #10 blade, with a #1 or #2 guard, to gently trim hair along the ridge of the skull. Use the thinning shears to lightly cut hair away at the corners of the eyes. Clean the top of the head with a trim by a #8 blade or #2 or #3 guard. Trim inner ear hair with a #10 blade or #1 or #2 guard. Also trim the hair in the dog's paw pads to a short level, using either thinning shears or the current blade. Employ a nail grinder to shorten your schnauzer's nails. Dust his ears with canine ear powder to help prevent wax buildup.